Posh skipper Alex Woodyard in action in Tuesday's Carabao Cup defeat at QPR. Photo: Joe Dent/theposh.com. 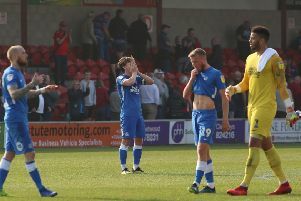 Captain Alex Woodyard won’t let his Peterborough United team-mates become complacent or over-confident despite an excellent start to the League One season. Posh head into Saturday’s 9August 18) contest with Luton Town at the ABAX Stadium sitting pretty in joint second place after two wins in two matches. Mark O'Hara (right) celebrates a goal at Rochdale last weekend with teammate Matt Godden. Photo: Joe dent/theposh.com. But Woodyard, a veteran of long, successful campaigns at Lincoln City in recent seasons, will play his part in keeping Posh feet firmly planted on the ground. “Successful teams stay level-headed whether they are winning or losing,” Woodyard said. “It’s vital players don’t get too high when we win or too low when we lose. Woodyard was one of 16 summer signings made by Posh. He believes the club’s strength in depth will be crucial as the season wears on and he doesn’t believe his place in the midfield starting line-up is secure just because he wears an armband. “The depth of the squad is unbelievable,” Woodyard added. “I’m happy with how it’s gone for me, but the fact I’m skipper won’t keep me in the side. “There are some excellent players battling for every position so we will all have to play well to keep our shirts. “I’m enjoying playing with Mark O’Hara though. We complement each other well. “He’s much more attack-minded than me and to score three goals in his first two games is outstanding, but he does his fair share of defensive work as well. Posh manager Steve Evans insists Luton will be a level above Bristol Rovers and Rochdale, the two teams beaten by his side so far this season. “Luton are very good,” Evans stated. “They play good football, they will be well coached and they will be well supported. “I expect us to be playing in front of a big crowd on Saturday and we will experience a great atmosphere and I am confident we will cope with everything. Luton have sold over 2,000 tickets for the match. It’s their first Football League trip to London Road for 13 years. Luton fans nave been given the Motorpoint Stand for the match as well as part of the main stand. Posh are at Charlton in League One on Tuesday (April 21).